Breakin News India 360: MI vs SRH: MI won by 4 wickets! 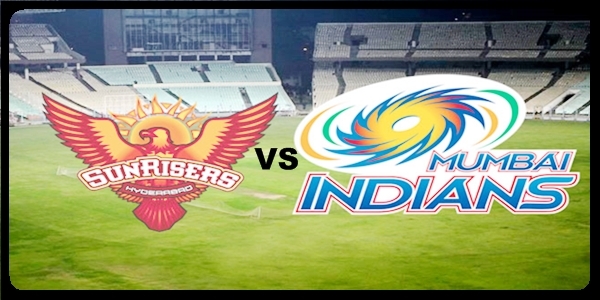 12 th April: On Wednesday night Mumbai Indians faced Defending champion Sunrisers Hyderabad at Wankhede Stadium in Mumbai. Mumbai Indians team beat Sunrisers Hyderabad team by 4 wickets in their 3rd match in IPL season 2017. Mumbai Indians team's captain Rohit Sharma won the toss and chose to bow first. So Sunrisers Hyderabad came down to set a target for Mumbai Indians.
. When Davide Warner gets out Hyderabad team started to collapse like leaf. Whenever Sunrisers start to make partnerships, it's broken by Mumbai Indian's bowlers. Davide Warner scores 49(34) and Shikhar Dhawan 48(43). At one time Sunrisers Hyderabad 105/1, by sudden collapse it able to score of 158 with loss of 8 wicket in their 20 overs. Whenever Sunrisers start to make partnerships, it's broken by Mumbai Indian's bowlers. Davide Warner scores 49(34) and Shikhar Dhawan 48(43). Mumbai Indians team didn't get start well as did precious both the games. Nehra strikes and dismissed Jos buttler 14(11).Captain Rohit Sharma continued his bad form in this match also, his inning ended for just 4 run.Parthiv Patel played a short knock 39 runs in just 24 balls. He crossed 2000 IPL runs when he reached 24 runs individual. Mumbai Indians team loose their 3rd wicket as Parthiv out, team score was 79 runs. Again last match winning player Nitish Rana came to rescue team Mumbai. He played a good knock of 45 runs of 34 balls. At another side not hardik Pandya, but this time Krunal Pandya gaves a contribution for his team to win the game. He scores 37 runs in just 20 balls with 3 Four and Six each. Mumbai Indians reached the winning target with 8 ball left. With this win Mumbai Indians jumped up for the 3 rd position on the pointstable. *Warner played one extra ball! ?